The online security market is expanding globally, and for good reason. The dramatic increase in connected devices has created a huge attack surface for cyber criminals. Whether their motive is mischief, or theft, the impacts can be far-reaching and very costly. As an example, the downtime cost on Amazon’s North American sales operations as a result of the 2016 'Dyn' cyberattack -- ~211 minutes of service disruption -- resulted in a loss of $32 million. Most companies don't have the same eCommerce revenue as Amazon, but this event demonstrates the impact a cyberattack can have on targeted companies. Global business investment on cybersecurity solutions will grow by 33 percent over the next 4 years, reaching $134 billion annually by 2022, according to the latest worldwide study by Juniper Research. 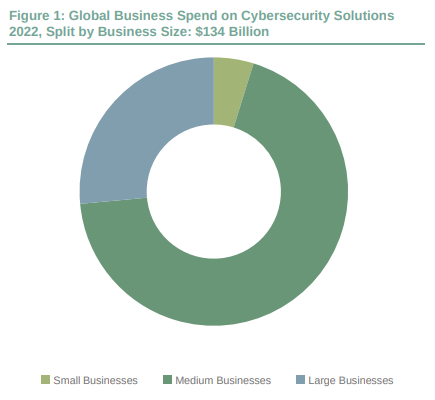 Their new research analysis found that nearly 70 percent of 2022 spending would originate from medium-sized businesses, as cybercriminals target some of the least protected commercial operations. In the context of strategies for financial services, mobile operators, enterprise and IoT service providers, the research highlighted that digital transformation and IoT were key catalysts for increasing spend to defend IT assets from cyber threats. Juniper anticipates that the cumulative cost of data breaches between 2017 and 2022 will reach $8 trillion, with variable per-business losses depending on the nature and scale of the attack. Organizations must now plan for risk mitigation, rather than prevention. Moreover, service providers in high-risk environments will be forced to restructure their networks to avoid potential compliance breaches, data theft or service outage. "Once a single endpoint is breached, the big danger is lateral movement across the network. Layered networks, proper lifecycle management and user ‘least privilege’ approaches will prove key to containing serious breaches," said Steffen Sorrell, senior analyst at Juniper Research. Securing the IoT, with 46 billion connected units anticipated in 2021, would require more forward-thinking. With devices ‘in the field’ for years at a time, adopting a cybersecurity strategy that can adapt to future demands is essential. The study also uncovered that cybercriminal efforts can defeat some approaches. For example, the Cerber family of ransomware has analyzed how machine learning systems detect malware behavior and applied evasion techniques.